It's a specialist processor, but LF Max Punch could be just what's needed to give your bottom end a kick in the pants. Flexible and effective. Useful Monitor feature. Mono setting for centralising bass. Voxengo's global options system. Competitive price. Not a 'must-have' processor. Interface functional rather than stylish. 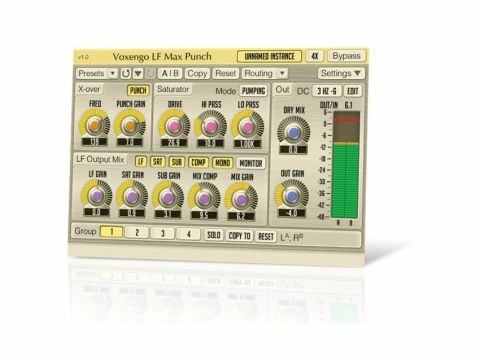 Voxengo's LF Max Punch covers similar ground to existing bass processors - Waves MaxxBass, for example - offering synthesized sub-bass enhancement and dynamics processing. In fact, it's the successor to two previous Voxengo plug-ins, LF-Max and LF-Punch, making both of these obsolete. It incorporates all of their functions along with numerous further improvements. On the technical side, LF Max Punch works by splitting the signal at the input stage, processing the low frequency (LF) aspect only, then recombining the two signals at the output. The split or crossover point is adjustable from 20Hz to 300Hz, and it's this setting that's the key to achieving the desired result. Immediately following on, you'll find the 'punch' process, which ties in with the crossover, affecting the dynamics at that point. It ranges from -12dB to +12dB, and so is subtractive as well as additive. Next up, the Saturator enables you to drive or distort the signal (-20dB to +50dB) in both normal (linear) and pumping (non-linear) modes. To keep things in check, this section also includes both low- and high-pass filters. In the LF Output Mix section, each element of the processing has its own on/off toggle switch and gain control (+/-24dB), with a Mix Gain knob for blending the LF signals. Then there are a few more extras: the Sub Gain adds in a synthesized harmonic one octave below the input crossover point; the Mono option centres the entire LF portion of the signal; and the Monitor switch lets you hear just the processed signal. In addition to some large, bold meters, the Out section includes overall level and separate Dry Mix controls for blending the original signal back in with the processed one. Finally, there's a selectable DC filter with three slope types (6dB, 18dB and 36dB) for removal of very low frequencies up to a maximum of 20Hz. The plug-in also enables you to level each process separately, which is enormously practical. And, if you really want to hear what's going on, the Monitor switch lets you hear each element in isolation. In our tests, we started with bass guitar and found that, with a high crossover point, saturation of the majority of the low frequencies added solidity to the sound without touching the higher 'attack' frequencies. The kick drum, with its fixed frequency range, was best treated with the punch processor. The crossover frequency was also critical here, with the Punch Gain acting like a transient shaper. Overall, the hardest element to use was the sub bass processor, and it seemed to work best on fixed-frequency sounds such as kicks. LF Max Punch offers an affordable take on the bass enhancement process, effortlessly producing results that are much harder to achieve in other ways. And the reasonable price makes it an even more attractive option.